On Stage Magazine review 9 to 5, the Musical. On Stage Ottawa: Should you see it? Orpheus Musical Theatre’s production of 9 to 5: The Musical follows three female secretaries in the 1970’s who, fed up with all of the sexism and harassment perpetrated by their male overseers, hatch a plan to take control of their office and redefine what a work day should really look like. When one thinks about must-see musicals, Dolly Parton’s 9 to 5: The Musical isn’t usually on anyone’s top 10 list, probably not most people’s top 100 list, and there’s definitely a reason for that. The script is just God-awful. Now I must admit I have never seen the 1980 film that this musical is based on, but after seeing the stage production, I think I’ll pass. The problem I have with writing this review is that there are just as many pro’s as there are con’s yet they need to be separated into two categories. The biggest pro as to why 9 to 5: The Musical is worth seeing is the cast. Orpheus has brought together by far one of the most talented casts that I have seen on stage in a long time. They oozed professionalism from the first moment they stepped out on stage until the final curtain call. 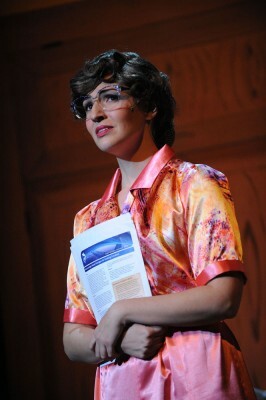 Melinda Hudson, in the lead role of Judy, was superb. She never missed a step or a beat, owned the stage every time she took it, and her closing solo “Get Out & Stay Out” was by far one of the most powerfully sung solos I have seen on stage in a long time. The other two leads, Beki Lantos (Violet) and Christa Cullain (Doralee) also held their own and provided a much needed energy to keep the show jumping from number to number. The choreography was great. Each and every person knew where and when they needed to be and hit their marks. One of the dancers even handled an accidental wardrobe malfunction with perfection to the point where I doubt few people actually noticed it. However, a phenomenal cast can only take a bad script so far. 9 to 5: The Musical bills itself as a tongue-in-cheek musical comedy. The problem is, it’s rarely funny, it’s rarely tongue-in-cheek, and well, every single song sounds the same. This is Dolly Parton after all. The jokes are base and on the head, coming across as more cheap than clever, the content, while trying to address sexual harassment perpetrated by men in the workforce is over the top, and at some points even two-faced. The ending is rushed and completely nonsensical with the most blatant and in your face use of Deus Ex Machina I have yet to see on stage. I dread to think what this production would have been like with a less than stellar cast. All in all, phenomenal cast aside, 9 to 5: The Musical feels like a day in the office… you just can’t wait for it to be done. Do you want to know what's going on On Stage in Ottawa? And not have to come looking for it? Drop in your name and email below and we'll send On Stage Weekly right to you every week. I agree with part of this review. I also found the cast extremely professional and talented. However I differ with his assessment of the script – sure the story line requires one to suspend one’s disbelief (doesn’t every musical?) but I found the show funny and thoroughly enjoyed it. Your observations about suspending disbelief is a necessity during musicals… and it makes the theatre even more enjoyable because each of us get to experience something different than the person next to us and take that away from the show. If you’ve ever followed any of my other reviews or work with On Stage or Production Ottawa you will probably notice that I’m always a little harsher on plot/holes/scripts than some of the other reviewers, perhaps I’ve just seen too many really bad shows that I am always looking for the stories that blow me away… Unfortunately, for me, 9 to 5: The Musical just couldn’t hit the mark… but then art is great because it’s subjective and we all get to experience it differently! Thanks so much for taking the time to check out our review! Let us know if you see anything good (or warn us about the bad stuff out there) in the future! Odyssey Theatre’s Lysistrata and the Temple of Gaia — The Slaves Called It. Dogfight: the Musical battles its rocky first act to come away victorious. Do you care how theatre is promoted in Ottawa? Do you want to see Ottawa theatre continue to get the best publicity possible? Is seeing Ottawa theatre get the exposure it deserves worth an hour a week of your time? Visit our Join the Team page to find out ways you can support On Stage, Ottawa's Theatre Arts Magazine.